And now for something new and fresh. I am more than pleased to announce The Converse Blog's YOUR CONS, YOUR STORY. I've been saying for a while that I wanted to hear from all of you, well now I really mean it. This is a chance to not only participate, but to be featured here at The Converse Blog. Here is how it works, send a picture of you wearing your favorite pair of Converse and your answers to a mini interview below. I'll post up the picture and your answers, or simply Your Cons, Your Story. Here is a list of what I need from you to participate. 1. Send a picture of you wearing your favorite pair Converse. 2. Your name, name of the shoe (if you know), and your location (optional) if you want to rep your city. 3. Your Story: Why do you wear Converse? What do you Love about Converse? What makes your favorite pair, your favorite pair? What do you want to see from Converse in the future? Feel free to write anything else you want to say about Converse, this is your chance to have your voice heard. Write as much or as little as you want, just keep your responses PG, this website is for everyone. So I can't have two post without a picture. So here is a picture taken back during game 1 of the NBA Finals. I am pretty sure I got this from Yahoo. 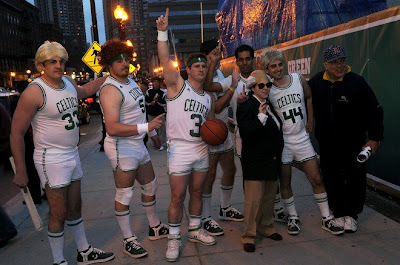 Anyway, these Celtics fans went all out gearing in short shorts, wigs, and even black/white Converse. At first I was bummed, because they weren't wearing Weapons. Then I thought it was pretty cool that a lesser known shoe like the Maverick got some love. Plus they haven't released a pair of Mavericks in like 3 or 4 years, so they've been holding on to these. Thanks for stopping in and I look forward to posting up all of the Your Cons, Your Story content.